Every day is unique, and for Shaun Livingston each day in which he can put his left foot on the ground is even more so. 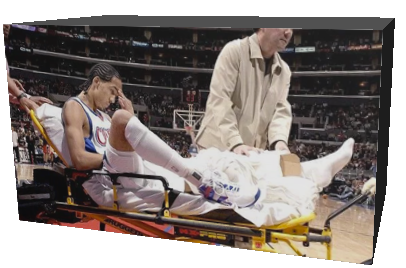 In the career of a professional athlete injuries are very likely to occur, every player is aware of this and there is no way to avoid it from happening, despite all the precautions one may take. On February 26th 2007, The Los Angeles Clippers, the team that had chosen him in the 2004 draft, in the fourth overall pick directly from high school, play at home against Charlotte. Minute 8:19 of the first quarter, the score is 7 to 4 to Charlotte. Shaun, then twenty, launches a counterattack but something goes wrong. He takes it easy, goes to the basket and jumps. He lands badly and literally explodes his knee. It is one of the worst accidents ever seen on a basketball court. Three out of four ligaments gone, there is a possibility that an artery may be torn, and at this point there is only one thing left to do: amputate. Yes, unfortunately, you read that right. Shaun Livingston after the first two and a half years was one of the most exciting prospects in the NBA. Two meters tall, long arms and legs, and a great vision for the game; these are the characteristics of the native Peoria, Illinois boy. A sublime passer, speed and athleticism off the charts, he was a possible and plausible All Star. Then, everything shattered: the ambitions, the certainties, and expectations. The fear of never coming back to the game, of losing a leg and broken dreams. Ultimately no severe damage was done to the artery. After having averted the worst, Shaun faced a very delicate reconstruction of his knee ligaments. Operation, rehabilitation, and finally he returned to the court. After a year and a half of all this, very few were willing to bet on Livingston. The Clippers didn’t want him anymore; no one wanted him anymore. He tried with Miami but was cut at once. He ends up in the D-league (the development league of the NBA), and eventually returns to the first league moving from Oklahoma, Washington, Charlotte, Milwaukee and Cleveland. Nothing. He fails to have impact. He decides to go to Brooklyn where things change. He has a new sense of confidence and is well supported. He begins his second life. The season with the Nets is excellent, mental toughness and steel balls do the rest. He leaves the Nets for the Golden State Warriors who have just been taken over by head coach Steve Kerr. Shaun is a rising star and backup MVP to Stephen Curry. He embraces the role and makes it his at 360 degrees. He does not miss a thing. He helped the Warriors out of difficult situations several times in the final league set, which Golden State won 4-2. From a possible leg amputation to a rising NBA star – this is the story of Shaun Livingston. It is a strong example of what it means to have a second chance. It is necessary to fight for what you want to achieve because no one will hand it to you on a silver platter. Once you achieve your goal you have to work three times as hard to ensure that it doesn’t slip between your fingers. Shaun has done everything right and has been rewarded with the highest accolade a professional basketball player can dream of, the NBA championship ring.